Student Co-teaching: A Participatory Experience! Lucy shows off the page in Thanking the Moon where she helped me pronounce the word correctly based on her knowledge of Chinese. Today something wonderful happened. I was doing a lesson with Kindergarten comparing and contrasting the Mid-Autumn Moon Festival with Thanksgiving. We used PebbleGo to read informational text about Thanksgiving and fact check with what we knew about Thanksgiving. Then, we read Thanking the Moon by Grace Lin to learn about the Moon Festival. At the end, we used an interactive Venn diagram from Read, Write, Think to compare and contrast. During the story, I was first thrilled when a student was so excited that he recognized some of the names for sister, father, etc. in the story. It made me remember the importance of students being able to see themselves and their cultures in the books on the library shelves and in the selections that are chosen for whole class lessons. The second amazing thing that happened was when I came to a word in the story for older sister, Jei Jei. I of course did not know the correct pronunciation, and I immediately knew I was wrong when the student who was so excited about the book did not recognize the word that I read. 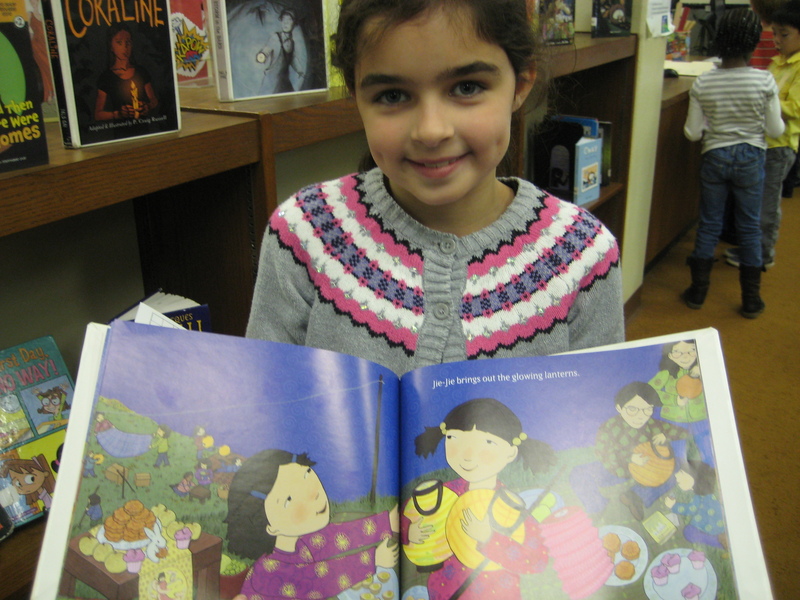 Amazingly, Lucy, a student, was in the library working on a project and checking out a book. She just happens to take a Chinese class after school, so she graciously shared the correct pronunciation and got us back on track. She did this without any prompting. I was so excited that she chose to participate and that she felt comfortable enough to interrupt my lesson in order to share that information. These small moments really inform my bigger vision of the library as a site of participatory culture. I hope that by sharing this, students will continue to find ways to get involved in any way they can in our library program. This entry was posted in Participatory Culture, Uncategorized and tagged Grace Lin, participatory culture, student leadership, student participation.